Say goodbye to waiting around for lab and test results. Save time and money with us! With our in-house lab and pharmacy, you'll never have to waste time waiting for results of prescriptions ever again. You can depend on us to always go above and beyond to make your cat or dog's vet visit as convenient and pleasant as possible. Come to us for the caring service you and your pet deserve. As well as providing exceptional veterinary care and hospitalization services, we also offer affordable boarding for dogs and cats of all ages. You won't have to worry about Fluffy and Fido while you're on your business trip or vacation. We take extra steps to ensure each animal is well cared for during his or her stay. You'll experience peace of mind knowing your furry friend is safe and content. With our overnight boarding and early drop-off options, you can rest easy knowing that your pet is in a secure and stress-free place. Let us help you make your hectic schedule a little more bearable. Give us a call today to learn more. 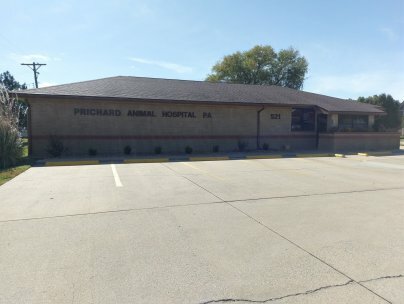 At Prichard Animal Hospital, we treat your pets like the valued family members they are.